Patients with tuberculosis (TB) present pulmonary involvement most frequently. Microscopic examination of acid-fast stained sputum smears remains the most useful diagnostic method and positive samples establish indications for initiation of TB therapy and respiratory isolation. However, in some cases of pulmonary TB acid-fast bacilli stains in sputum samples may be negative or respiratory specimens may not be available, and other methods have to be used to establish the diagnosis of TB. Apart from microbiological molecular diagnostic tests, different biochemical parameters have been proposed as helpful tools for this purpose, including various markers of cellular activity, acute phase reactants and enzymes [1-5]. The tumor marker Ca-125 has been proposed as a useful diagnostic tool for tuberculosis. Ca-125 serum concentrations are known to rise in some benign and malignant diseases [6, 7]. High levels of Ca-125 have been reported in patients with pulmonary and extra-pulmonary tuberculosis, including pleural, peritoneal, pelvic, milliary, and intra-abdominal disease. The diagnostic value of Ca-125 to help differentiate pulmonary tuberculosis from other pulmonary infections has been poorly studied [8-14]. In order to asses the efficacy of Ca-125 serum levels in differentiating pulmonary tuberculosis from bacterial pneumonia and other respiratory infections in patients with fever and pulmonary infiltrates, a retrospective study was performed. The study was performed at the Ramón y Cajal Hospital, a 1000-bed tertiary referral Hospital (Madrid, Spain), during a three year period (January 2004 to December 2006). By protocol, tumoral markers determinations are included in the ordinary biochemical form application. They are obtained from all patients admitted in the unit for differential diagnosis purpose, including malignancy, in patients with lung infiltrates. Ca-125 was determined by an electro-chemillumine-scence test (Elecsys 1010, Roche), including a radioimmuno assay (RIA) Packard Gamma counter. In all cases, tuberculosis was confirmed by positive culture in sputum or other tract respiratory samples. Serum Ca-125 levels were compared in patients with a diagnosis of TB infection versus patients with a diagnosis of bacterial pneumonia or other pulmonary infections. Patients with lung infiltrates related with oncologic process, heart failure, idiopathic interstitial pneumonitis or other non-infectious processes were excluded. ROC curves were used to determine the optimal cut-off value of serum Ca-125 which could distinguish TB from other pulmonary infections with the highest sensitivity, specificity, and predictive values . The curve obtained, allowed the calculation of the slope and the area under the curve (AUC). For some patients in the TB group, Ca-125 was also measured during follow-up (2 to 4 months after starting TB treatment). For the analysis of risk factors associated with TB infection, a case-control study was performed, considering TB patients as cases and patients with non-TB pulmonary infection as controls. Hospital records for all patients included in both groups to obtain information regarding clinical, radiological, and outcome characteristics were examined. The association between categorical variables was performed using Chi-squared tests with the Yates correction or Fisher Exact Test (two-tailed) as necessary. Continuous variable association was analysed with the Mantel-Haenszel test. Statistical analysis was performed with the SPSS software package (version 11.0; SPSS Inc, Chicago, IL). Informed consent: according to the IRB, only patients’ oral informed consent for the anonymous treatment of their data is required when the sudy protocol is the same used for regular medical attention of these patients in our hospital. A total of 89 patients was included in the study. Thirty five patients had culture positive pulmonary tuberculosis and 54 patients had other causes of fever and pulmonary infiltrates. * COPD: chronic obstructive pulmonary disease. # All three patients responded to clarithromycin and a probable atypical pneumonia diagnosis was established. In the control group most patients (68%, 37 patients) had a confirmed diagnosis of community-acquired pneumonia. Eight patients (15%) had chronic obstructive pulmonary disease (COPD) and were diagnosed of acute exacerbations with response to antibiotic therapy. The remaining 9 patients were diagnosed of nosocomial-acquired pneumonia (n=4), interstitial pneumonia responding to clarithromycin therapy (n=3), empyema (n=1) and pleuropericarditis (n=1). Sixteen patients (18%) had HIV infection; of these, 9 patients had tuberculosis and 7 patients had other pulmonary infections. HIV-infected patients had a median CD4 cell count lower than HIV-negative controls (124/ mm³, range: 12-358 vs 203 cells/mm3, range: 84-540), although this was not statistically significant. Ca-125 serum levels were significantly higher in patients with tuberculosis (mean ± SD, 104.9 ± 136.1 IU/mL, median: 46 IU/mL) than in the control group (mean±SD, 27.1 ± 19.7 IU/ml, median: 24). ROC curve analysis showed a relationship between the diagnosis of TB and Ca-125 values, with an AUC of 0.77 (95% asymptotic confidence interval: 0.66-0.87). The optimal cut-off value of Ca-125 for TB diagnosis was 32.5 IU/ml, with a sensitivity, specificity, positive predictive value and negative predictive value of 68.6%, 77.8%, 66.7% and 79%, respectively. A 68.6% of patients with pulmonary tuberculosis showed Ca 125 serum levels >32.5 IU/ml vs a 22% of patients with other pulmonary infections (p<0.01). No significant association was found between Ca 125 levels >32.5 IU/mL and gender, clinical and radiological presentation, including pleural effusion, extra pulmonary manifestations and HIV infection. Ca 125 levels were determined in 10 patients with pulmonary TB during follow-up, after 2 to 4 months of therapy. The mean Ca 125 value was 59.5 (± 88.5) IU/ml and the median was 31 (range: 13 to 63) (Table 1). Fig. (1) shows the decrease of Ca 125 values observed in these 10 patients during TB therapy. Basal and post-therapy (2-4 months) Ca-125 levels in 10 patients with pulmonary tuberculosis. Ca 125 antigen is a large molecular-weight glycoprotein synthesized by different cells originating from the celomic epithelium. Although classically it has been used to monitor the course of ovarian epithelial cancer, there are other circumstances associated with high serum Ca 125 levels, which decrease the sensitivity and specificity of the test when used generally/non-specifically. 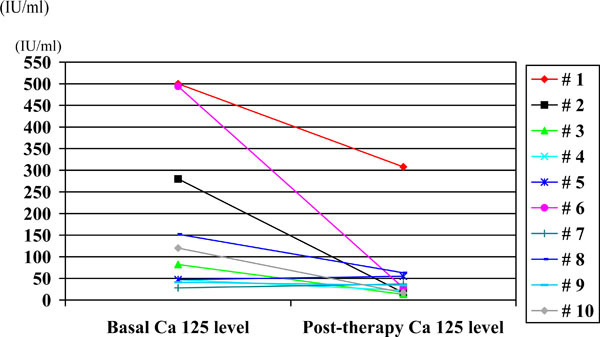 Ca 125 levels have been determined in mesothelial cell lines by immuno-histochemistry methods and in bronchial epithelial cells by immunoperoxidase stained techniques . If these cells are activated by physiological or pathological reactions, such as menstruation, inflammation or cancer, Ca 125 is released. Many malignant processes have been associated with high serum Ca 125 levels: including several tumors, other than ovarian epithelial cancer, such as pulmonary, hepatobiliary, gastric, colorectal, pancreatic neoplasias and non-Hodgkin lymphomas with mediastinal and/or abdominal location [17-20]. Other circumstances related with the stimulus of mesothelial cells, such as peritoneal dialysis, pelvic inflammatory disease, endometriosis, pancreatitis and autoimmune disorders have also been associated with elevated serum Ca 125 levels [7, 21-23]. Mirales et al. have reported increased Ca 125 levels (>35 IU/ml) in patients with previous surgery, pulmonary disease, heart failure, cirrhosis and intrabdominal disease . Other studies have confirmed high serum Ca 125 levels in tuberculosis, mainly in extrapulmonary locations with abdominal involvement [10,11,25-30]. Some authors have reported elevated serum Ca 125 levels in benign pulmonary diseases, including tuberculosis . Ronay et al. demonstrated the expression of Ca-125 in the proximity of tuberculous granulomas using an immuno-histochemical method in two patients with peritoneal TB probably due to proliferation of mesothelial cells . Another study, using anti Ca 125-labeled specific antibodies confirmed positive capture of antibodies on giant epithelioid cells in patients with pleural and peritoneal TB . A small number of studies have analyzed the role of serum Ca 125 in patients with pulmonary TB. A case-control study comparing patients with active tuberculosis with patients with cured tuberculosis confirmed a significant elevation of serum Ca 125 levels in patients with TB and a normalization of these levels during therapy . Mean Ca 125 levels in patients with tuberculosis were significantly higher than that observed in patients with past tuberculosis, or healthy patients. Moreover, a significant reduction of Ca 125 levels was observed in patients with pulmonary tuberculosis during therapy. For a Ca 125 value of 31 IU/ml, authors confirmed a sensitivity and specificity of 97.5% and 100%, respectively . This normalization of Ca 125 values during therapy of patients with pulmonary tuberculosis has also been observed in other studies [12,13,35,36]. An important contribution of the present study is the potential role of Ca 125 measurements in patients with fever and pulmonary infiltrates of unknown aetiology, with elevated levels supporting a diagnosis of pulmonary tuberculosis in patients where the disease was suspected but respiratory samples had negative AFB stains. In the present study AFB stains were positive in sputum in all but one case; in this case basal Ca-125 level was 150 IU/ml. Aoki et al., demonstrated a sensitivity, specificity and accuracy of 100%, 75% and 84%, respectively, for serum Ca 125 >35 IU/ml in patients with pleural tuberculosis . Patients with other pleural pathologies, such as mesothelial neoplasias, empyemas, para-pneumonic pleural effusions or autoimmune disorders, were used as controls. Results obtained with serum Ca 125 levels were similar or better than those obtained using pleural ADA (adenosine deaminase) levels >45 IU/ml, with a sensitivity, specificity and accuracy for this test of 81.8%, 89.3% and 87.2%, respectively . In the present study the number of patients with pleural effusion was low (4 in the TB group and 8 in the control group), but all patients with tuberculosis and pleural effusion had Ca 125 serum levels >35 IU/ml (data not shown). The present report has several limitations. This is a retrospective study and a specific protocol focusing on the relationship between Ca-125 levels and tuberculosis was not applied. Control patients were not homogeneous and included a miscellaneous of patients with a diagnosis of bacterial pneumonia or other pulmonary infections. A low number of patients with pleural effusion were included and a specific analysis focused in these patients was not possible. Patients with lung infiltrates related with oncologic process, but unsuspected at admission, were excluded. Finally, in only 10 patients a second determination of Ca 125 serum level was available for outcome analysis. In conclusion, the present study seems to confirm by mimicking the results of other similar studies, that serum Ca 125 levels in patients with pulmonary tuberculosis are significantly higher than that observed in patients with other causes of pulmonary infection. Ca 125 measurement may be recommended if pulmonary tuberculosis is suspected and AFB stain of respiratory samples is negative or not available. The decrease in levels during therapy may be useful to monitor patients with pulmonary tuberculosis. We have had full access to all of the data in the study and take responsibility for the integrity of the data and the accuracy of the data analysis. Ameglio F, Giannarelli D, Cordiali-Fei P, et al. Use of discriminant analysis to assess disease activity in pulmonary tuberculosis with a panel of specific and nonspecific serum markers Am J Clin Pathol 1994; 101(6): 719-25. Hosp M, Elliott AM, Raynes JG, et al. Neopterin beta 2-microglobulin and acute phase proteins in HIV-1-seropositive and -seronegative Zambian patients with tuberculosis Lung 1997; 175(4): 265-75. Aoki Y, Katoh O, Nakanishi Y, et al. A comparison study of IFN-gamma ADA and CA125 as the diagnostic parameters in tuberculous pleuritis Respir Med 1994; 88(2): 139-43. Taha RA, Kotsimbos TC, Song YL, et al. IFN-gamma and IL-12 are increased in active compared with inactive tuberculosis Am J Respir Crit Care Med 1997; 155(3): 1135-9. Verbon A, Juffermans N, Van Deventer SJ, et al. Serum concentrations of cytokines in patients with active tuberculosis (TB) and after treatment Clin Exp Immunol 1999; 115(1): 110-3. Hunter VJ, Weinberg JB, Haney AF, et al. CA 125 in peritoneal fluid and serum from patients with benign gynecologic conditions and ovarian cancer Gynecol Oncol 1990; 36(2): 161-5. Buamah P. Benign conditions associated with raised serum CA-125 concentration J Surg Oncol 2000; 75(4): 264-5. Yoshimura T, Okamura H. Peritoneal tuberculosis with elevated serum CA 125 levels a case report Gynecol Oncol 1987; 28(3): 342-4. Candocia SA, Locker GY. Elevated serum CA 125 secondary to tuberculous peritonitis Cancer 1993; 72(6): 2016-8. Simsek H, Savas MC, Kadayifci A, et al. Elevated serum CA 125 concentration in patients with tuberculous peritonitis a case-control study Am J Gastroenterol 1997; 92(7): 1174-6.
 de Paz NF, Fernandez HB, Simon PR, et al. Pelvic-peritoneal tuberculosis simulating ovarian carcinoma: report of three cases with elevation of the CA 125 Am J Gastroenterol 1996; 91(8): 1660-. Gurgan T, Zeyneloglu H, Urman B, et al. Pelvic-peritoneal tuberculosis with elevated serum and peritoneal fluid Ca-125 levels A report of two cases Gynecol Obstet Invest 1993; 35(1): 60-1. Miranda P, Jacobs AJ, Roseff L. Pelvic tuberculosis presenting as an asymptomatic pelvic mass with rising serum CA-125 levels. A case report J Reprod Med 1996; 41(4): 273-5. Belletti GA, Millán AE, López A, et al. Pelvic tumor, elevated CA 125 level and tuberculosis Medicina (B Aires) 2005; 65(2): 181-2. Hanley L, McNeil MM. The meaning of the area under a ROC curve Radiology 1982; 143: 29-36. Matsuoka Y, Nakashima T, Endo K, et al. Recognition of ovarian cancer antigen CA125 by murine monoclonal antibody produced by immunization of lung cancer cells Cancer Res 1987; 47(23): 6335-40. Bast RC Jr, Klug TL, St John E, et al. A radioimmunoassay using a monoclonal antibody to monitor the course of epithelial ovarian cancer N Engl J Med 1983; 309(15): 883-7. Haga Y, Sakamoto K, Egami H, Yoshimura R, Mori K, Akagi M. Clinical significance of serum CA125 values in patients with cancers of the digestive system Am J Med Sci 1986; 292(1): 30-4. Elias J, Kew MC. Evaluation of CA 125 as a serum marker of hepatocellular carcinoma Int J Cancer 1990; 46(5): 805-7. Simsek H, Kadayifci A, Okan E. Importance of serum CA 125 levels in malignant peritoneal mesothelioma Tumour Biol 1996; 17(1): 1-4. Niloff JM, Knapp RC, Schaetzl E, Reynolds C, Bast RC Jr. CA125 antigen levels in obstetric and gynecologic patients Obstet Gynecol 1984; 64(5): 703-. Kadayifci A, Simsek H, Savas MC, Toppare M. Serum tumor markers in chronic liver disease Neoplasma 1996; 43(1): 17-21. Moncayo R, Moncayo H. Serum levels of CA 125 are elevated in patients with active systemic lupus erythematosus Obstet Gynecol 1991; 77(6): 932-4. Miralles C, Orea M, Espana P, et al. Cancer antigen 125 associated with multiple benign and malignant pathologies Ann Surg Oncol 2003; 10(2): 150-4. Imai A, Itoh T, Niwa K, Tamaya T. Elevated CA125 serum levels in a patient with tuberculous peritonitis Arch Gynecol Obstet 1991; 248(3): 157-9. O'Riordan DK, Deery A, Dorman A, Epstein OE. Increased CA 125 in a patient with tuberculous peritonitis case report and review of published works Gut 1995; 36(2): 303-5. Wani AM, Akhtar M. CA-125 a marker for diagnosis and follow-up of pleuroperitoneal and lymph node tuberculosis Ann Saudi Med 2008; 28(2): 142-3. Rodriguez LR, Lado FL. CA-125 adenosine deaminase, and PCR for Mycobacterium tuberculosis in the diagnosis of peritoneal tuberculosis Scand J Infect Dis 2006; 38(8): 749-50. Corapçioglu F, Güvenç BH, Sarper N, Aydogan A, Akansel G, Arisoy ES. Peritoneal tuberculosis with elevated serum CA 125 level mimicking advanced ovarian carcinoma in an adolescent Turk J Pediatr 2006; 48(1): 69-72. Younossian AB, Rochat T, Favre L, Janssens JP. Ascites and highly elevated CA-125 levels in a case of peritoneal tuberculosis Scand J Infect Dis 2006; 38(3): 216-8. Diez M, Cerdàn FJ, Ortega MD, Torres A, Picardo A, Balibrea JL. Evaluation of serum CA 125 as a tumor marker in non-small cell lung cancer Cancer 1991; 67(1): 150-4. Ronay G, Jager W, Tulusan AH. Immunohistochemical and serologic detection of Ca-125 in patients with peritoneal tuberculosis and ascites Geburtshilfe Frauenheilkd 1989; 49(1): 61-3. Hirose T, Ohta S, Sato I, et al. Tuberculous pleuro-peritonitis showing increased levels of CA125 Nihon Kyobu Shikkan Gakkai Zasshi 1997; 35(2): 196-200. Yilmaz A, Ece F, Bayramgürler B, Akkaya E, Baran R. The value of Ca 125 in the evaluation of tuberculosis activity Respir Med 2001; 95(8): 666-9. Sevinc A, Adli M, Kalender ME, Camci C. Benign causes of increased serum CA-125 concentration Lancet Oncol 2007; 8(12): 1054-5.